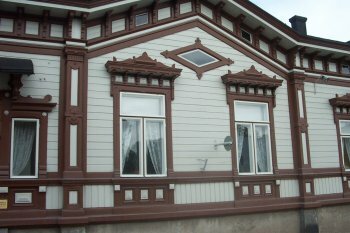 Old Rauma is an outstanding example of a traditional Nordic city constructed in wood. The town was built in the 15th century around a Franciscan monastery. It is a harbour town at the Gulf of Bothnia. There are about 600 original wooden houses left. 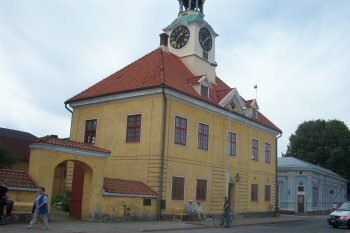 The oldest date from the 18th century when Rauma was rebuilt after a ravaging fire. Most of them though are from the 1890s, as a result of prosperity brought on by seafaring. Rauma on Finland's west coast is well on the tourist track, but that still doesn't mean crowds in August. Like the other WHS we visited on this trip, the signposting was perfect, the parking free and the terrace food & drink plenty. The major wooden buildings in Old Rauma are clustered around two main streets and the market place. Most are turned into shops or museums. Lace-making is a very big item here, not something I do get excited about. Roaming around the backstreets is pleasant though. My last visit to Rauma was when I was child and only memory from there was shop selling moustache wax so it was time to go back and visit the city properly. After the revisit I was quite disappointed. The old town lacks authencity and was overcrowded by cars. It's so weird that all the locals drive through old town instead of driving around it which I'm sure would be faster way to get to the other side of city. I have never see so much cars in old towns where I have visited before. And I think the market square is totally ruined with those canopies. They look ugly and don't fit with the buildings around square. But despite all these complains I think Old Rauma is worth of visit if you're staying in Finland. The buildings are absolutely beautiful and even for me it felt that I was somewhere else than in Finland. 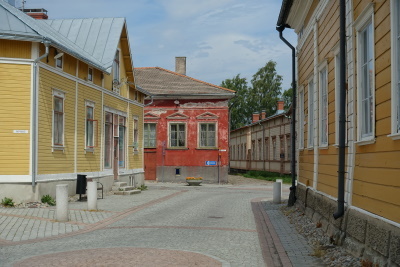 Outside of old town Rauma is also wonderful town. If possible try to visit the archipelago outside of Rauma. Besides the bus services to Turku and Helsinki there is a train + bus service that I took to Tampere. In addition to the buildings Els mentions, I found the Holy Cross church quite picturesque with its gleaming white tower. Old Rauma is a delightful town of wooden houses from the 18th through 20th centuries (about 600) each of which has its own name written on the side in gothic letters. The helpful folks in the tourist office, a short walk from the bus station, have materials in many languages about the town and region including a self-guided walking tour of the tour that should take a leisurely 2 hours to do. (Highly recommended). I was there in April but I understand the town can get very crowded with bus tours in the summer months. There are several homes that have been converted into musueums (the Merla House is the most interesting)and many shops (lace is their speciality) and restaurants in all price ranges. It's a lovely place to just wander around the narrow cobblestoned streets and enjoy the scenery. It's a 4 hour bus ride from Helsinki (two or three direct buses Monday through Saturday) or an hour and a half from Turku, which has more frequent bus service. 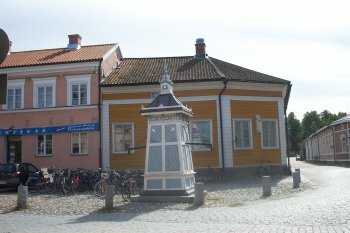 Falun Red: Although it is not a primary color in the old town, it is widely used in the buildings. Watch the Schätze der Welt video of Rauma (from about 12 min) where they cook punamulta / Falun Red in traditional way for Old Rauma buildings. 103 Community Members have visited.